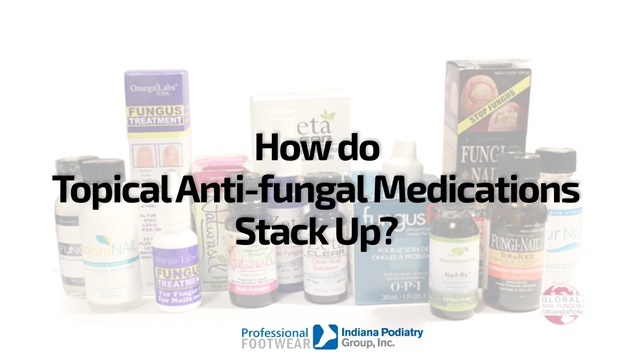 How do topical anti-fungal medications stack up? You may see commercials for topical Jublia as it is a newer medication on the market to treat toenail fungus. It has an effectiveness rate ranges from 60-80% and must be used on the nail once/day for up to 48 weeks to reach total cure of the toenail fungus. It comes with an easy applicator but can be expensive if not covered by insurance. There is an older topical medication called Penlac Nail Lacquer. It too has a similar effectiveness level, however, can be more difficult and messy to apply. It is typically less expensive though than the Jublia. Most other OTC medications taught effectiveness levels of around 30% including Vicks Vapor Rub applied daily. If you are suffering from toenail fungus, come discuss treatment with a physician at Indiana Podiatry Group, we would be happy to help you!